We have many more rooms we love at great pricing. In addition, we often times have free night offers that allow us to upgrade room categories for not much more money. Simply call us 1-800-838-3725 to discuss all your options. We often times have deals available to us that are not printed online. Sandals offers guests great value providing deluxe all-inclusive packages, luxury accommodations, gourmet dining, and fantastic service. For those on perhaps a tighter budget who want to get the most out of their Sandals vacation dollar, we have provided some helpful hints to guide you in the right direction. 1) The least expensive Sandals resort is Sandals Ochi. Sandals Carlyle Inn is also very inexpensive but is very small in size and does not offer its own beach or spa. 2) Sandals discounts are usually greater the further you book in advance. Sandals room cost tends to increase as the resort fills and the closer you get to your travel date (one exception is sometimes the last minute deals offer which offer 1 free night, however, this is usually limited to 3 night stays only.) Booking non-holiday periods or during off-peak periods such as Fall offer lower resort rates compared to peak periods. Remember, to lock in a sale rate, it simply requires a $400 deposit which is fully refundable up until 45 days before travel. 3) Bahamas and Jamaica are generally the cheaper flight as compared to Antigua or St. Lucia. Booking flights at least 3 or 4 months in advance is generally less expensive. Flight prices generally increase as the flight fills. 4) Within each Sandals resort, the rooms are generally furnished the same and the only difference is type of view (garden, oceanview, oceanfront), proximity to the beach, type of service (standard, club, butler), type of room (standard, suite, 1BR suite, etc), or special amenity (private pool, swim-up, whirlpool tub, etc.). The least expensive room category in each Sandals resort is the Deluxe category which generally has a garden view with the exception of Sandals Whitehouse which offers ocean views for all rooms. 5) Concierge Club service offers personal check-in, reservations, and fully stocked complimentary in-room bar. The least expensive Concierge Club service rooms are found in Sandals Montego Bay and Sandals Grande Riviera. 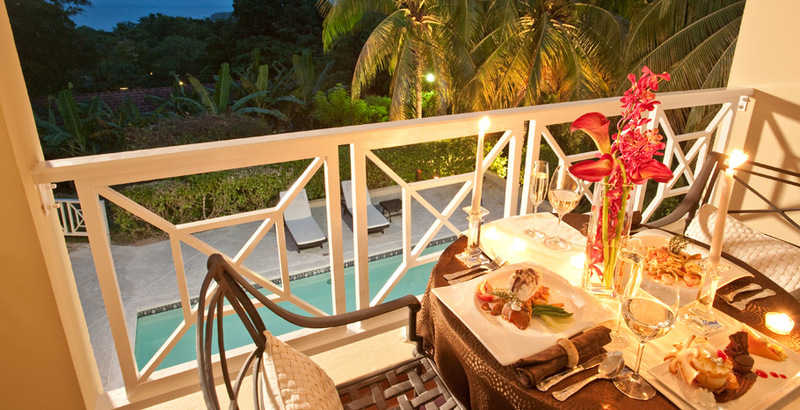 6) For Honeymooners, all room categories qualify for the complimentary honeymoon package. 7) Oceanview rooms offer at least partial view of the ocean. Oceanfront rooms offer ocean views with no obstructions. 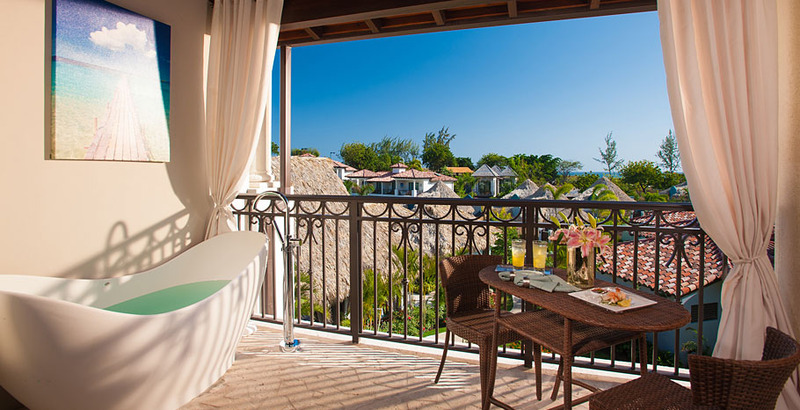 Least expensive Oceanview room is generally found in Sandals Carlyle Inn and Sandals Montego Bay. 8) Butler Service offers unforgettable service provided by your personal butler throughout the stay. 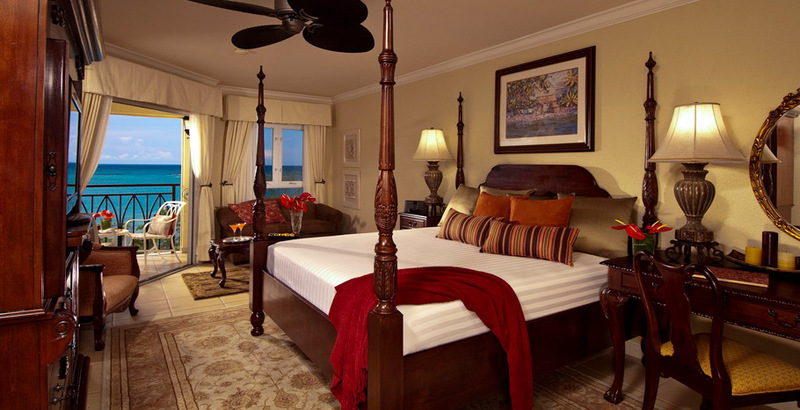 Least expensive Butler Service room is in Sandals Montego Bay and Sandals Grande Riviera. 9) For those interested in St. Lucia, Sandals Halcyon is the least expensive of the 3 resorts (all 3 resorts have full exchange privileges). 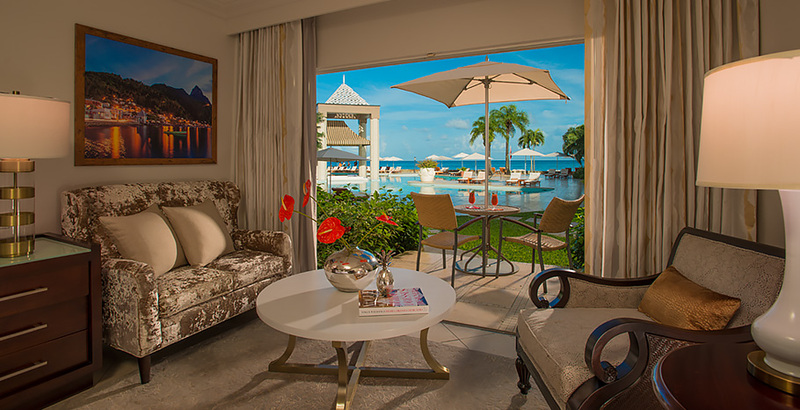 Comparing the Deluxe Category rooms, Sandals Grande St. Lucian are the most luxurious and a move up to the Premium category offers a view overlooking the attractive lagoon pool.